Today is the epitome of a November day: gray, drizzling, sleepy, and sniffling. I awoke at 8:15, hoping the clock actually said 6:15. Everyone else was still asleep, and I strongly suspected that we would not make it to church this morning. Randy went to bed sneezing and wheezing and was just as miserable this morning, so we opted to stay home. Randy's mom and her husband had spent the night at our place on their way back up to Indiana after a Thanksgiving trip to Charlotte, so we got to spend a leisurely morning with them. She was wheezing and sniffling, as well. I think they all need to stay far away from me. I drove up to Johnson City (2 hours from here) to visit my friend Tracy this weekend. Her husband was on his annual hunting trip and her son was with a friend, so we enjoyed a girls' weekend, complete with spinach pizza, a chick flick, and, of course, the obligatory stops at Target and TJ Maxx. Tracy's little daughter Savannah is simply fabulous. I should have packed her up in my suitcase and put her under the Christmas tree for Laurel. When we get a Christmas tree, that is. Next weekend would be our usual Christmas-tree-chopping-down day, but Laurel is in a production of A Christmas Carol all weekend. Really, I should be showering and preparing for this afternoon's all-day dress rehearsal, but somehow I just can't make myself be productive yet today. This cold, drizzling, gray November day. I'm ready for December—what about you? It's never about the food on Thanksgiving Day, although that's what most of us talk about in the preceding days. I live in a state of perpetual thanksgiving, truly. I am always mindful that I have been blessed with a wonderful life. How can I not be thankful? For me Thanksgiving Day itself is purely about family. I don't see my brothers and their families much, although we three siblings in the south live within 45 minutes of one another. It's just the way life is. Perhaps when our children are grown we'll get together for cards in the evening; but for now, we enjoy holidays and birthdays together. My niece April got married a couple of years ago, and not only do we like her husband, but, more importantly, he brought two kids into our family. Laurel and Duncan got instant cousins of practically their same ages! Duncan and Xavier are of matching silliness. 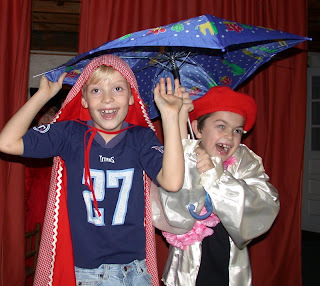 Here, they are acting out a bizarre rendition of Little Red Riding Hood. Laurel wishes she could spend lots more time with Carena. 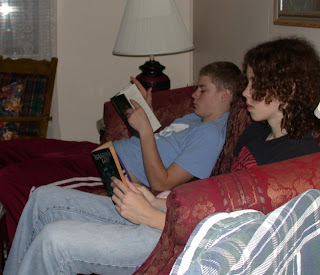 Jesse and Isaac are both extremely sociable. Most exciting of all, we got to get lots of good loving time in with my great-niece, Abigail. She is too delicious for words. Laurel and I have been dying to get our hands on her, as it's been months since we last saw her. Laurel really needs a baby sister, but a baby cousin will have to do! 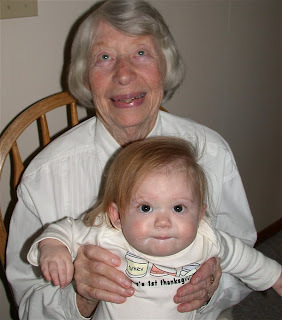 I love watching my mom with her great-granddaughter. Is there anything better on a late November day than a sweet, warm, sleeping baby? I hope you all had a lovely day. 6. Incredible friends. Really, really amazing, lovely people that continuously bless my life. 7. And the Village People. You know who you are, and if you're wondering if you are, the answer is yes. 8. 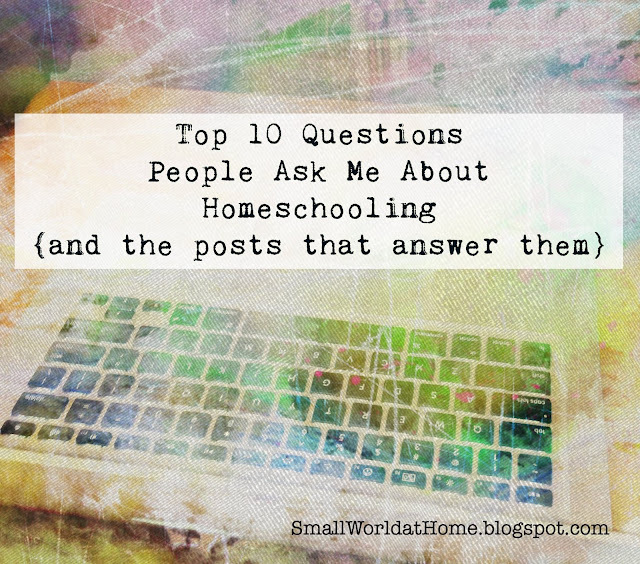 Our homeschooling support group. What a treasure. 9. 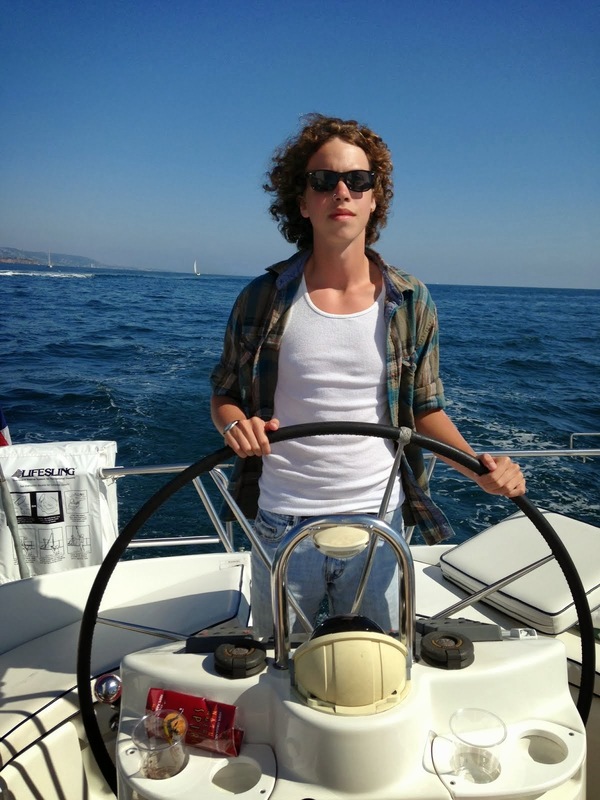 Being able to homeschool: the freedom to do so, the means and desire to do so. 14. My extended family: my brothers and their families, in-laws, aunts, uncles, etc. 26. Did I mentioned having been raised in a loving, secure, educationally-minded, Christian family? 27. Did I mention my sweet, precious family—Dr. H and the kids— who are so much more than I could ever have asked for? This is my friend Myrtle, when she came to visit me in college about 21 years ago or so. Today is Myrtle's 44th birthday, and I'm pretty sure I've known her since she was 16. Isn't that amazing? Her name isn't really Myrtle; it's Janet. 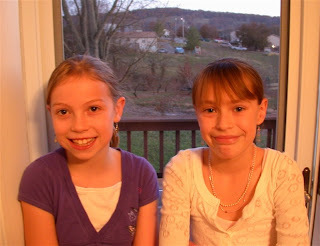 And before we were friends, we were mortal enemies. Teen-age girls are often like that, especially when it has to do with a boy. We despised each other fervently for a brief time, and then, suddenly, we were inseparable. My memory doesn't allow me a glimpse of what transpired between war and peace; perhaps Janet can fill in those gaps. Janet was in my brother's class, two grades above me, but our social circle was the same, since my boyfriend was part of that circle. Janet made me laugh, and she took good care of me. Our life together was constant adventure, punctuated by bouts of angst. 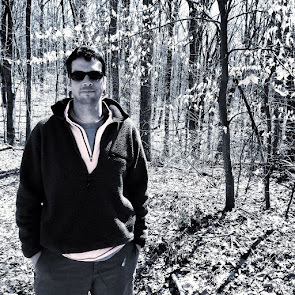 I picture us in oxford shirts and jeans, sweaters slung over our shoulders, feet bare in Docksiders. We hung out at the Yacht Club, at Pooters, at the bay, the golf course, and people's houses. There was always something going on back then; we lived in a small town that thrived on parties. Somewhere along the line Janet and I, imagining ourselves old ladies, nicknamed each other Myrtle and Bernice. We are closer now to those old ladies than we are to our teenage selves. And then Janet graduated. We had one last wild summer together, and then Janet started college, leaving me to re-establish friendships with classmates my own age. The next years are a blur in my memory, and then, during my senior year in college, we faced death. 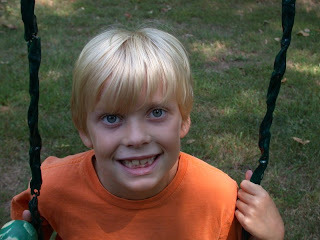 When we lost Bryan, everything shifted. Janet, always more stable than I, grew more determined and purposeful. And I, shaken and weary, plodded ahead. From his casket we took a piece of blue ribbon, which we shared and carried in our wedding bouquets. We are linked by blue ribbon and a hundred nights of bonfires and bar stools. We are linked by a hometown with streets that haven't changed, by the red and black of our high school, by marriage and births and a death that froze our past and altered our future. It is a good, good thing to have a lifetime friend, who knew you from the moment you began forming into an adult, and with whom conversation—and laughter—still come easily. Happy Birthday, Myrtle. Or are you Bernice? I've napped both days this weekend. I am not a particularly good napper. I wake feeling heavy and nauseated, and somewhat guilty. When I was a child, I loved naps. I came home from school many days, wrapped up in an afghan, and napped. In high school I fell into a heavy, drooling sleep each afternoon during swim season especially, waking slowly to the sounds of supper preparation. My mother was so sweet. I don't ever remember her waking me to set the table or pour drinks on those afternoons. 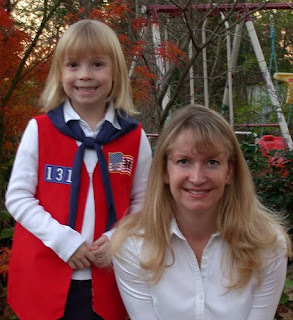 She was in tune with my level of physical and mental exhaustion and knew, because she was a well-read but intuitive parent, that I needed rest. In college I would nap for hours on the weekends, naps full of layers and layers of dreams. Have you ever had those dreams in which you dream you are waking up, and then in your dream you realize that you are dreaming, and you try to climb out of the pit of dreams to finally resurface, only to find that you are still dreaming? It's quite dreadful. Those were hard, exhausting days, mentally and emotionally. Also, I stayed up way too late most of the time, except during my senior year when I was doing my student teaching. I was actually responsible then. 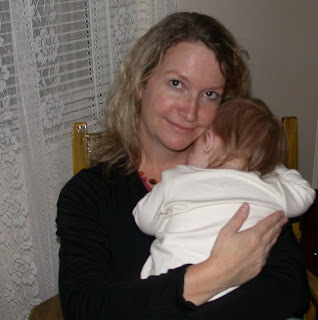 When my children were small, I napped more frequently, often ostensibly to get them to nap. Now I find that my actual need for naps is nearly gone. My days are less stressful, physically and emotionally, than perhaps they ever have been. I've learned balance, and the vast majority of the time I get a full night's sleep. My children are not nappers, and I wonder how much that has to do with the relative relaxation of their lives. They don't have to awaken early in the morning, and they don't have the emotional exhaustion that comes from being around people all day. Even my teenager, who by definition as a teenager should be napping and lazing about, never does. The Napping House, we are not. But sometimes I crave the decadence of just reading in the middle of a cold afternoon, and unfortunately, reading while prone always leads to sleep for me. And now I feel vaguely disconnected from the day, trying to remember what I was doing, fitting back into the groove of a Sunday afternoon. What about you? Are you a napper, or do naps leave you feeling disconcerted? So my mother brought this over to me the other day: "Look what I found, honey! Remember when you did this?" Yes, I remember quite well. But what I mostly think is—and my mother joins me in this now—is: how could my mother have allowed me to do this job? I had graduated from college just a few months before I began this job in October 1988. 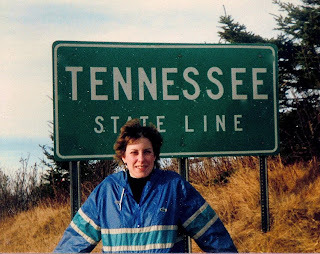 Randy and I had gotten engaged in September and were to be married in March; so I was just biding time at home in New York, embroidering my trousseau, until I moved back to Tennessee. I needed to earn some money, but getting a "real" job was silly since I'd be leaving the state in just a few months. So I entered the world of temporary employment. For a couple of months I worked at Cornell University's New York State Agricultural Experiment Station, where my father did research, as, well, I have no idea what I did actually. I picked experimental raspberries, measured them, and recorded the data. (Just the kind of thing an English major is trained for.) That's all I remember. I put my name in as a substitute teacher and got called frequently. That was hideous. But that could be another whole post. And then one day my mom read in the paper, "Census Workers Needed. Good pay." And whatever the pay was, it was pretty good. So I took the Census Workers test and passed, and was then given my route. Here's what I did: every morning I went to my district manager's apartment. (Hmmm. Should my parents not have been concerned that their daughter had to go to a creepy man's apartment every day?) He gave me my daily assignment. I then went to the village of Interlaken, about 30 miles from my home. According to Wikipedia, "As of the census of 2000, there were 674 people, 256 households, and 175 families residing in the village." I'm sure the population of Interlaken was right about the same a decade before, and I have probably knocked on the doors of most of those 256 households. My job was to go door-to-door, asking who, exactly, lived in the houses, and marking them on my little chart. Yes, I walked up to houses with sagging porches and yards full of engine parts to ask, "Excuse me, but are you Mr. So-and-So and who else lives here?" I knocked on beautiful old houses and was told by sweet old ladies that they were living all alone now. I drove out in the country and fought off barking dogs. Sometimes I'd circle around a particularly creepy-looking house, summoning the courage to pull in the driveway and knock. But nothing slightly bad or scary ever happened, other than the barking dogs. I know my mother was praying for me every day. I remember this as a quiet, lonely job, in spite of all the people I encountered each day. This was before the days of cell phones, but it was also before CSI and other such shows. I can't imagine now letting a 22-year-old daughter go from door-to-door out in the middle of nowhere, any more than I can imagine letting my 8-year-old ride his bike 5 blocks away to the corner market, as my mom did with me. This always leads me to ponder: are people really more horrible than they were 20-30 years ago, or have we just watched too much TV? Anyway, at the end of each day I'd return to my harmless, lonely manager's apartment and turn in my daily log. I did this job for about 6 weeks and was tremendously happy when it was over. It was certainly one of the oddest jobs I've ever had and way outside of my comfort zone. Knocking on strangers' doors? Was that really me? So what should I write about next: my life as a telemarketer for the Shriners' Circus, or my career as a Shoneys waitress? Both were unforgettable experiences. * I really can only blog for a couple of minutes because I can hardly hold up my arms. Seriously, the past 2 days have largely entailed unloaded 450 boxes of citrus from a semi-truck and loading them back into people's trunks. We just got the delivery from our fall citrus fundraiser for American Heritage Girls. I am not a wimpy girl—I do lift weights on a regular basis—but my arms are seriously so tired that I can hardly type. I am pitiful. * I had the opportunity to be part of the Children's Book Blog Tour this week, reviewing Diane Shore's Thanksgiving book, This Is the Feast. You can check out my reviews here on my SmallWorld Reads blog, but let me just say that I loved this book. I highly recommend adding it to your Thanksgiving collection. * Even though I could hardly move, I still went to our support group's monthly Moms' Night Out. The company was excellent, the food okay, and the dessert simply perfect. * And really, that's all I can write. 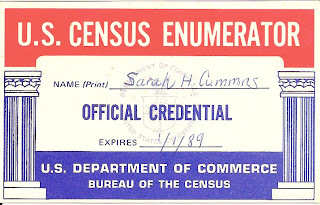 I seriously was going to have this fascinating post today about my life as a census worker, but I just have to put down my arms. Rubber. I wish he cooked every single meal! But then I guess I'd have to go find a job that earns money, and that would be really icky. So, I'll just appreciate his weekend cooking! Best Sense of Humor: Jesse. He is just funny, and he totally has our sense of humor. He is always cracking me up. He just gets it. This girl is amazing. Whether it's coming up with a costume (above), sewing, art, crafts, doll clothes, cooking or myriad other mediums, she is constantly creating something. He just always has a smile on his face. He does get mad and grumpy, but he can't stay mad and grumpy. Within a few minutes, he is almost always smiling again. In spite of her piercing bark when someone pulls in the driveway, Daisy is the absolute best dog. She loves us so much that it just breaks my heart. Every morning there is one hideous camel cricket that appears in our kitchen. 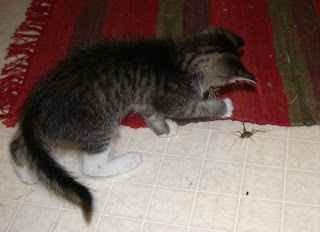 Fortunately, our new kitty is a champion cricket catcher. It's not a pretty sight to see what she does with it. 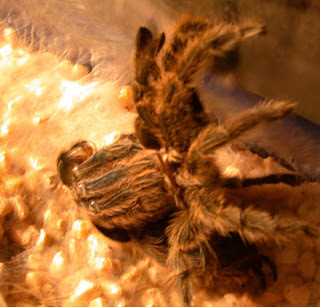 Really, it's a tarantula. Need I say more? Want to see other awards? Click on the link above. 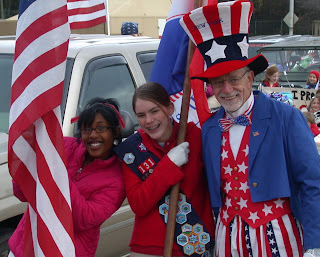 And don't forget to vote for ME for the Best Variety Blog at the Homeschool Blog Awards! 1. Big Check. No, not the kind that goes in the bank. That would be a beautiful thing, too. Whenever Randy or I finish something big, we look at each other and say "Check!" while drawing a giant checkmark in the air. We are big nerds, but we like each other that way. 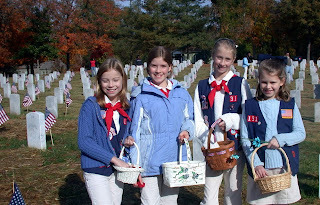 Anyway, last night was our Fall Awards Ceremony for American Heritage Girls. It involves all kinds of preparation starting several weeks ago, when we had to collect badge orders and then order badges, all the way through making the Joining Award lapbooks, to planning the actual ceremony itself. And, of course, carrying out the ceremony. I really can't explain the relief that Caroline and I feel when we've finished an awards ceremony and all the flurry of activity that precedes it. Big, big check. 2. Miscellaneous paperwork–check. I despise paperwork. I truly find it bordering on painful, and yet I continue to organize things that involve paperwork. In my ideal life, all forms could be submitted via the internet. But the reality is that we are still a paper, stamp, and envelope society. I'm sure there are good things about that, but whatever. These past few days I've completed and mailed nearly all of the forms and letters that have been piling up in a shocking way. Tomorrow, the bills. 3. Heat. My parents have heat finally. Oh, this is such a long and gruesome story, but to shorten it: when they moved into their new house a month ago, they discovered that the furnace was shot. For the past two weeks they've been told daily "we'll be there tomorrow" but the furnace repairmen. And every day has passed with no sign of them (and they have to use these guys, since the seller has to pay for most of the furnace replacement). Not necessary a huge crisis in Tennessee in autumn, but this past week has been downright cold. Thankfully, today—the coldest day yet—was the magic day. Within just a couple of hours, my parents had heat. And that is a beautiful thing! What beautiful things are happening in your world today? I'm taking a very short break in my afternoon of ceremony preparation to post this Monday Memory. Six years ago we had our first American Heritage Girls Fall Awards Ceremony. 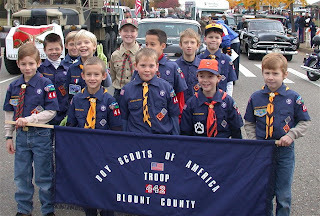 We started our troop in September 2003, so we'd only been a reality for a few months. Caroline and I were terribly nervous. We'd never done an AHG ceremony; in fact, we'd never seen an AHG ceremony! I was sure I'd break down and cry, or the sound system wouldn't work, or we'd sound like big dopes. But all went beautifully. 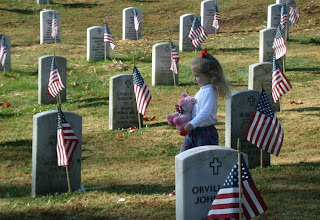 I do remember getting choked up, as I do every single ceremony still. It's impossible to look out at a sanctuary full of families, including dozens of girls in red, white, and blue, and not get a lump in your throat. Impossible to look at those sweet faces and not see the future. 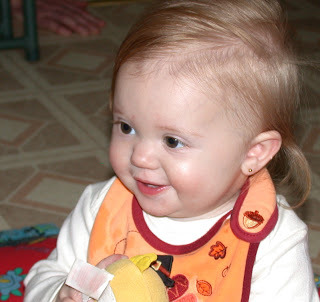 Now I get choked up looking at this picture of Laurel, who was just barely six when we started. 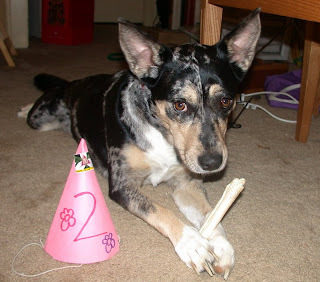 She's 11 now, almost one of the really big girls. Tonight we are getting for our 11th ceremony (we have two each year), so we're much less nervous. 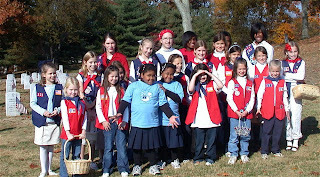 Still, our troop is over twice the size it was back in 2003, and we never lose the joy of knowing that what we do makes a difference in the lives of all these young ladies. And in turn, they will make a difference in our world. That makes all the organization, speech-writing, badge ordering, and paperwork worth it. 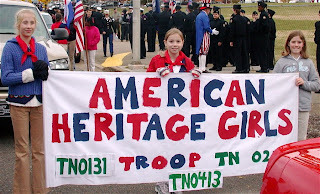 We have lots of historical sites in our area of the country; Tennessee is a hoppin' place for history. 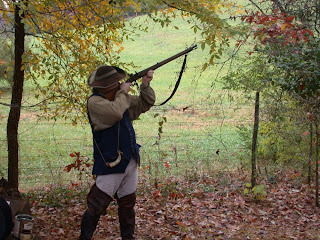 Last Friday we spent the day at the Sam Houston Schoolhouse for a fantastic living history day and Thanksgiving feast. The candles turned out beautifully. The teachers were so kind and patient and full of good information. 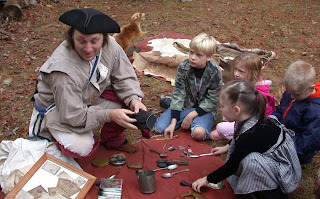 They were fascinated by this man, who taught them about different tools and essential items used in the early 1800s. All they really wanted to do was touch all his cool stuff. We had a delicious Thanksgiving feast, as well, with everyone bringing the fixings. The weather was perfect, the company delightful, and I even met a few new folks. 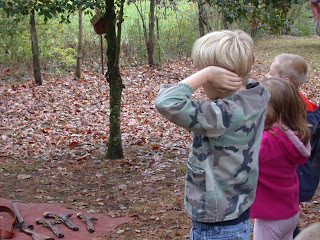 Have you had any fun field trips lately? What kind of historic sites do you have near your home? 1. High School Musical 3. Yes, it's hokey, but what a joy for my friend and I to take our two very patient daughters to finally see HSM3. There is just something timeless about watching preteen girls enraptured by all that singing, dancing, and sweetness. 3. The new kitty. I'm really a cat person, although we have the most faithful dog in the world, and I just love having this new little kitty curled on my lap. And there is not much sweeter than a little girl with her heart's desire sleeping next to her on the couch. What's beautiful in your life this weekend? This week's Heart of the Matter Online topic: The Things That Make Our Family Unique. 1. 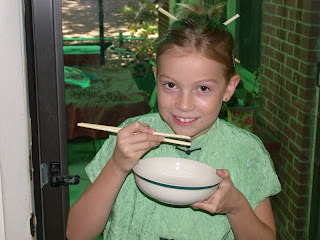 I grew up in a green, crunchy, and thrifty family. At times in my adult life I have rebelled against all of these things, especially the thrifty part. When I see people being excessively frugal or obsessive about food, I have to bite my tongue. I am quite sure that being excessive about anything can have the opposite effect on one's children. All that to say: we are a family of moderation. We are pretty green, somewhat crunchy, and Dave Ramsey followers (that has to do with the rebelling-against-thriftiness thing). 2. We actively embrace "forgive and forget." We don't hold grudges in our family and rarely remember grievances. My husband and I never dredge up "wrongs" from the past. We address issues and move on, and I think this drastically reduces the stress in our lives. I hope this is one trait that gets passed on to our kids because it sure does make life more enjoyable! 3. My husband is our weekend chef. 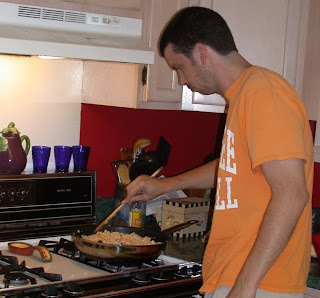 He loves to try new recipes, but the kids always want their three favorites of his repertoire: fried rice, chicken piccata, or fettuccine Alfredo. 4. We are homebodies. We all enjoy being around people, but we wear out quickly and are glad to be back in our own home. On the other hand, we all like to do a little something out-of-the-house each day—as long as, at the end, we can come home and have down time. 5. We are quiet people—for the most part. Duncan can be the exception to this; in fact, he is often the loudest boy in a group. But for the most part, we keep the volume low, both with our own voices and with TV/music, etc. 6. We are geared toward academia. Nearly everyone in my family has been or is some kind of teacher. Dr. H. is a professor. Four out of 5 of us kids in my family once did or do now teach at some level (high school or college); our spouses are all or were teachers/professors; and our parents both have masters' degrees in education. At this point, our oldest is interested in pursuing a career in academia and our middle child thinks being a teacher would be nice...until she has her own children. 7. We are musical. 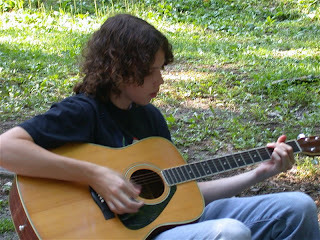 We all enjoy music tremendously and have made learning instruments a priority. None of us have great singing voices, nor are we brilliant on any instruments, but we can sight-read well and enjoy the discipline of music. Besides that, we all enjoy listening to a wide variety of music. We definitely have a soundtrack running through our lives. 8. My three kids were born in three different states. These three states represent different stages in our life, and I like that we have a child from each one. 9. I try to never think this phrase: "We are behind." Some weeks we (my younger two) may only do a few hours of actual bookwork. 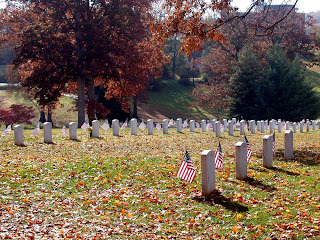 Like this week, for example, among other things we had our enrichment classes at co-op on Monday; participated in a Veteran's Day parade and listened to talks by veterans on Tuesday; read history, had PE, and did an AHG project on Wednesday; had drama, American Heritage Girls and Cub Scouts on Thursday; and attended a fantastic day of history at the Sam Houston Schoolhouse today. We did not one lick of math or grammar. And I think my kids got a tremendous education this week. 10. We all like the computer. A lot. What's unique about your family? See more fun posts at the Heart of the Matter Online. 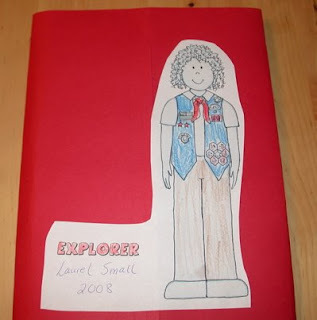 Back in the summer, my American Heritage Girls co-coordinator and I decided it would be a brilliant idea to make lapbooks this year for all the new members. The first award that a new girl gets is called her Joining Award, and there are about 10 different requirements necessary to earn the award. 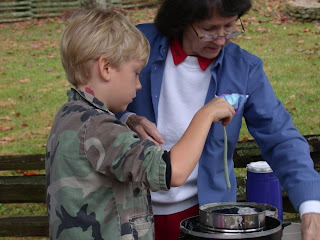 We talk about all of them during troop meetings, but we thought it would be awesome for them to have a hands-on tool for learning and as a keepsake item. I've spent a great part of the past two days frantically printing, adjusting, folding, and assembling 15 lapbooks. 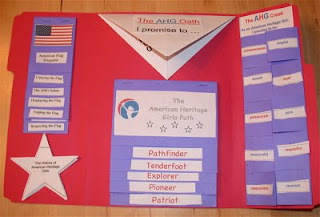 We wanted to present a ready-to-assemble lapbook to each new girl, so that she just has to cut, glue, write, and decorate. 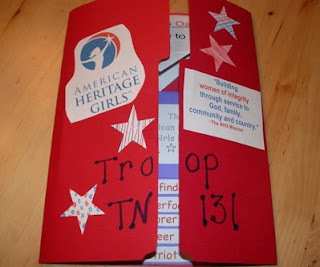 The girls get a folder with directions to each individual component. The blank books are already put together; they'll just have to cut out and glue the text and pictures and do some writing and coloring of their own. 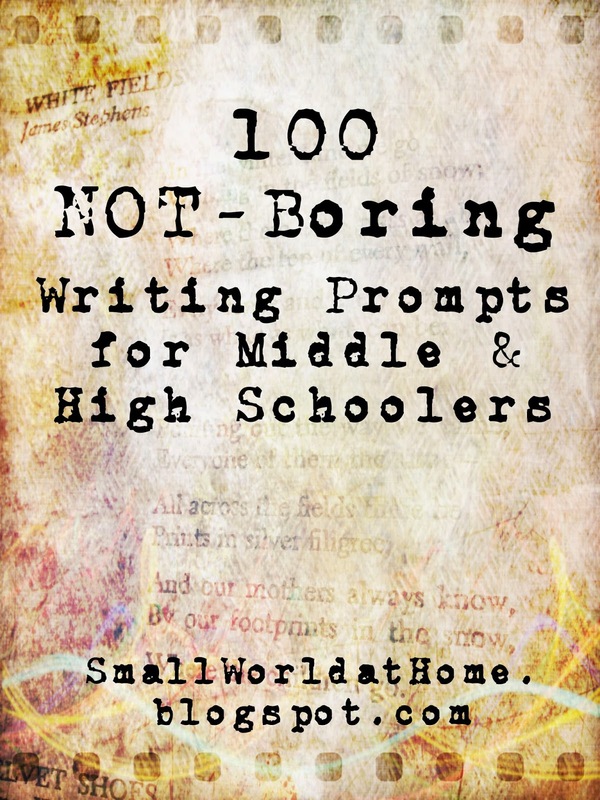 This week's Homeschool Memoir asks for our "Mom" help: what do we do when we need a break? First of all, my day usually goes best if I have a couple of hours in the morning to myself. I do the majority of my thinking work (paperwork, stuff for American Heritage Girls, lesson plans, email communications, blogging, etc.) between 7 and 9 a.m. If I don't have that time in the morning, I am generally a bit off for the day. Besides that, my break time is almost always on the computer. The absolute best way for me to veg out is by playing some kind of word game on Facebook: Prolific (like Boggle), Wordscraper (like Scrabble), or Word Twist (thanks a lot, Marci!). I pretty much lose all of them all the time, but it's fabulous for vegetating. I also have my daily rounds of blog reading, which I save for times when I need a break. Another way that I clear my head is by cleaning. I'm not by any means a neurotic cleaner, but sometimes I absolutely have to reduce the clutter level in the house in order to restore some kind of balance in myself. Every stack of papers that gets sorted, every surface that gets wiped down, every wilting plant that gets watered helps me feel a bit steadier. I'm seeing some vacuuming in today's plans. 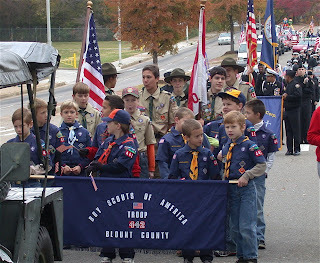 from American Heritage Girls Troops TN 131, 215, and 413; Boy Scout Troop 442; and Cub Scout Pack 442. That seems like such a long time ago. I can hardly bear looking at those sweet little faces, confirming that what all those older women always said is really true: "Cherish them now because they grow up so quickly." I had a bad dream last week. 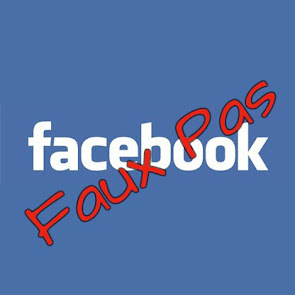 In my dream, my friend yelled at me, flinging accusations. I awoke feeling uneasy, and the feeling stayed with me, pinching me every now and then, spurring me to action. My dreams don't come true very often. I might dream that my teeth are falling out, but my teeth are never loose in the mornings when I awake. I might dream that I've forgotten to go to a class all semester and will surely fail the exam, but the waking reality is that I graduated 20 years ago. I sometimes dream that Randy and I never married, and my heart cries out for the children I never had and the love I lost. I wake from that dream first with a broken heart, and then with tears of gratitude and relief. But this dream of last week, this one came true. Perhaps I shouldn't be blogging about this, although my friend made it clear that she doesn't read my blog. 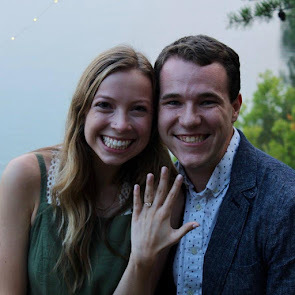 I had a conversation several months ago with a friend and fellow blogger who went through a major life change last year. We discussed how I found it all so shocking because she never mentioned any of this in her blog. We talked about how blogs record but a portion of one's life because so much has to remain unsaid. 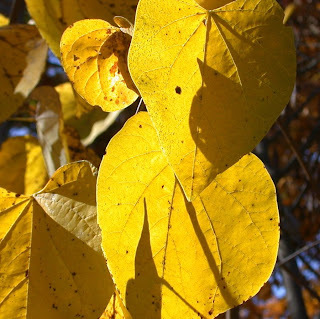 So I'm leaving the rest unsaid, but to blog about how startling the yellow gingko trees are against the blue sky seems superfluous on a day like today, when I am feeling bruised and shattered and left pondering how to begin the repair. 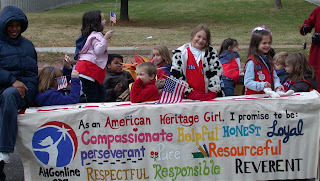 Several weeks ago, one of our American Heritage Girls' moms called to tell me about a great opportunity for our girls. 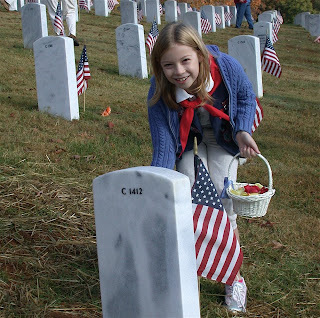 Each year before Veterans' Day, various groups traditionally place flags by each headstone at Veterans' Cemeteries throughout the country. 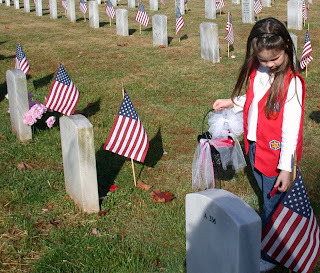 Her sons were going to be participating in this, and she thought maybe our girls could place flower petals at each site, too, following an old tradition of girls placing a single flower on soldiers' graves. We though this was a fantastic idea and jumped on board immediately. What we didn't anticipate was how difficult it would be to find a source for flower petals. Free flower petals, that is. We were turned down over and over again. Turns out lots of places sell flower petals and didn't want to donate them, even for this. On Thursday—with decorating day looming on Saturday— we were feeling close to panic without a single petal donated. (But with plenty of places willing to sell them to us!) And then I visited the flower shop which our church uses. She said she'd give me whatever petals she had on Friday, and gave me a phone number for a Knoxville Kroger store. I called that florist, and she said she'd give me everything she had on Friday, perhaps even 3 buckets full of rose petals. We were feeling much relieved. On Friday Caroline revisited a Kroger that had previously sounded skeptical. That Kroger gave her about 14 bouquets, for a total of about 150 long-stemmed flowers: daisies and mums mostly. I stopped by the flower shop and she gave me about 2 buckets (2-gallon size) of fresh rose petals. We were feeling ecstatic. This morning on our way to the cemetery, we stopped by the Knoxville Kroger, which had promised us 3 buckets of petals. We walked out with 6 buckets overflowing with beautiful petals. We were overwhelmed and immensely grateful for this abundance of petals. Kind of reminds me of the loaves and fishes. Initially we hoped to have enough petals to decorate one section of the cemetery. 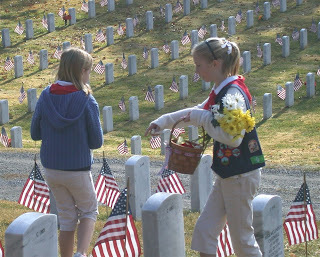 Instead, we managed to leave petals at nearly every site and also placed the long-stem flowers at the wives' graves. Amazing. My Mom and Dad came along, too. My Dad is a veteran of both World War 2 and the Korean War. 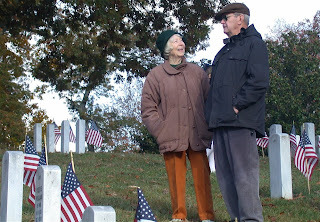 You can read more about my father's experiences in the wars here. This was one of those weeks that moved at some kind of bizarre super speed. It started fabulously enough. The kids at church put on a fantastic program. 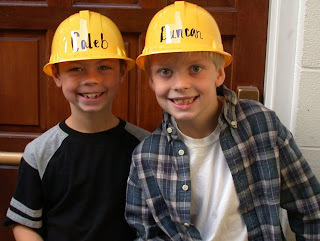 Duncan and Caleb, above, were part of the "Kids Under Construction" play. I could watch stuff like that every week. I was so amazed watching Duncan, whose whole goal in life is to play exuberantly, be very serious about this program. He appeared to know the words to all the songs, as well as all the hand motions, and I was impressed. 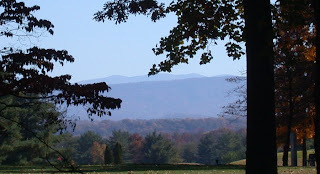 I love this view of the Smokies from my front yard. I've felt distracted all week, with what seems like dozens of odds and ends of things to do: badges to order, people to call, things to arrange, paperwork to fill out. 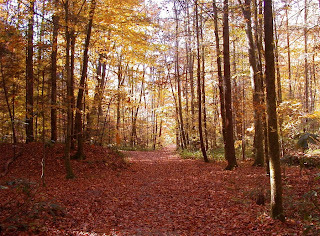 Stepping outside and breathing in autumn has an instant calming effect on me. So we spent a lot of time outside this week, doing school by the sandbox. The leaves reached perfection this week. 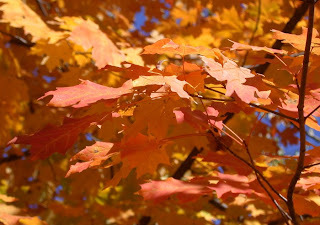 Although autumn is always gorgeous here, I haven't seen a fall this spectacular in years. At the end of a too busy week, I am less frazzled because of early blue skies and red leaves, and now the sound of a November rain. I'm so happy today that it's time for Randi's Recipe Box Swap because my mind is truly too befuddled to have profound thoughts. This goes back to my blogging lesson #22: "If you can't think of anything to blog about, post a recipe." This is one o f our Top 10 Family Favorites. Every member of the family loves this, so we have it at least a couple times each month. It is based on the Bhuna gosht and dhal recipes in Usborne's Children's World Cookbook, which I dearly love. 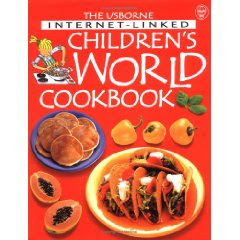 (If you don't have a copy of this fabulous around-the-world cookbook, find an Usborne consultant or buy it on Amazon!) This is supposed to be a lamb dish, but I use chicken instead. Cut the chicken up into 1" cubes. Add salt and lemon juice and let marinate for 15 minutes or so. Melt butter in skillet. Chop garlic and saute briefly in butter. Stir in all the spices and then add the chicken. Make the bouillon and add it to the pan. Let it all bubble over low heat, stirring occasionally. Cook for 20-25 minutes. (You can also do this is the crockpot. Cook on low for about 4-5 hours. I like to brown the chicken in the skillet before adding it to the crockpot.) Serve with dhal (below) over rice. Serves about 4. Cover lentils with water and bring to a boil. Cook for 10 minutes or so. (Watch carefully that they don't scorch.) Turn off and let soak for at least 30 minutes. More is fine. About 30 minutes before you are ready to eat, add the rest of the ingredients and water to about 1-2 inches above lentils. Stir well and simmer about 20 minutes or until lentils are soft. You may need to add more water. We like ours a little soupy. Serve with sour cream or cucumber raita (below) over rice. Peel the cuke. Cut it into spears and take out seeds as much as possible. Dice. Add to yogurt or sour cream and season. Mix well. Serve with lentils and chicken. 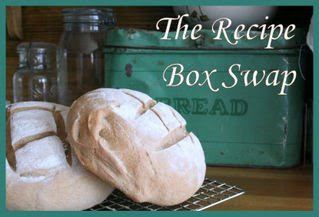 Check out more fabulous recipes at the Recipe Box Swap! 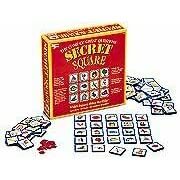 Secret Square: This is a great game for ages 3-10 or so. It's sort of a 20 questions game, in which 25 picture pieces are laid out in a square. One player hides a token while the others try to find it by asking questions about the picture it's under. If the player asks, "Is it an animal?" and the other player says "No," all squares with animals are removed, and so on. This process continues until players have narrowed down the square that hides the token. The game is simple, yet calls for thoughtful questions to win quickly. Requires no reading. Unfortunately, this game isn't sold new anymore; however, you can buy it on eBay or other used sites. It's worth perusing the web to see if you can find it somewhere! 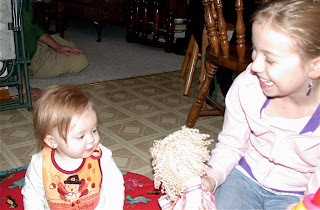 20 Questions for Kids: This is a game that all three of our kids can play, and I enjoy it, too. This is a basic 20 Questions in board game format, with 150 question cards. Each card has a person, place, or thing with 20 clues about the subject. Players take turns trying to figure out the clues ("I am a city in France" "I have a large tower in me"), and both the reader and the guesser advance based on how many questions are asked. Occasionally we'll get a card that the kids just don't know, so we just skip that one. 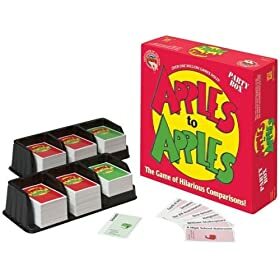 Apples to Apples: This game is way too much fun, and you can play with a huge group of people of all ages, or just a few people. The object of the game is to be the player who has the word card that best defines a given word. Players are dealt five red apple cards and try to make the closest match possible to a word on the judge's green apple card. For example, you may have the following red apple cards in your hand: the Mall, Video Games, Getting a Haircut, Thanksgiving Day, and My Family. Your task is to convince the judge (who rotates) which of your cards (My Family, for example) best defines the green apple card, which may be, for example, the word Frightening. You must persuade the judge to pick your card over your competitors' (why is My Family more frightening than Mt. Everest?). Probably good for ages 7 and up, although a particularly verbal younger child could play. We have the Junior edition, which is great for all ages. The regular version has a lot of words (particularly people) that kids just wouldn't understand (Richard Nixon, Central Park, etc.). Snapshots Across America: This is a great way to get a hands-on U.S. geography lesson while learning a little bit about each state. 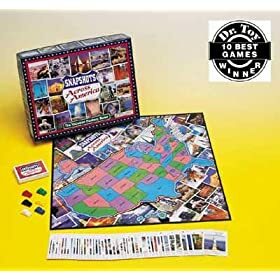 The object of the game is to travel to collect famous attraction cards while traveling across the U.S. by car, train, boat, or plane. This is another game that all the kids can play, although Duncan needs a little help and tends to quit before the game is over. 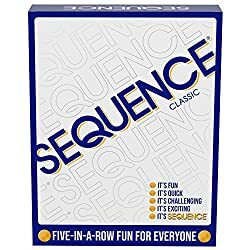 Sequence: Yet another game that everyone can play, including grandparents, aunts, uncles, and cousins. We play the adult version; I'm not sure what the benefit of the Junior version would be. The object of the game is to get a sequence of 5 chips on the board, matching a card in your hand to a space on the board. Lots of strategy involved and great to play as partners. Set: This is a game of visual perception, which is challenging for us because we are more words than picture people around here. Each card contains one of three symbols in varying numbers, colors , and types of shading. 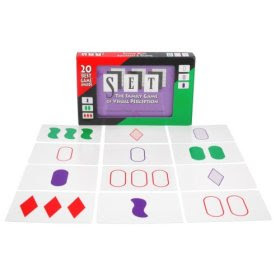 The dealer arranges 12 cards and the players, at the same time, scan the images for logical "sets" of three cards. This one has to be played carefully because younger kids can get frustrated easily. I really love this game and think it's fantastic for logic, but I prefer to play it one-on-one with a child. For some reason, this brings out the not-so-pretty-competitive side of my kids! So those are a few of our favorites, besides the old stand-bys. We're always in the market for new games, so leave a comment if you have a favorite, and--in the spirit of Apples-to-Apples--convince me that we should try this for our family!